DES MOINES, Iowa - The Round Rock Express (65-73) rode a five-run surge in the third inning to a 7-5 victory over the Iowa Cubs (50-88) on Sunday afternoon at Principal Park in Des Moines. Express starter RHP Adrian Sampson (8-4, 3.77) took the win after he allowed three runs, all earned, on five hits over 6.0 innings in his final start with the E-Train this season. The right-hander finishes the year with a 3.37 ERA as a starter and an 85/24 strikeouts-to-walks ratio. Rehabbing Chicago Cubs RHP Tyler Chatwood (0-1, 9.45) walked five batters en route to allowing five earned runs in the loss. The I-Cubs landed the opening blow in the bottom of the second. 3B Jason Vosler got the balling rolling with a one-out single and moved into scoring position when RF Jacob Hannemann reached on an infield single. With two outs, LF Trey Martin singled to center to put Iowa ahead 1-0. Round Rock's bats came alive in the top of the third, surging for five runs on two hits and four walks. SS Cliff Pennington and DH Tony Sanchez worked back-to-back walks to leadoff the side. The next batter, 2B Nick Noonan , brought both runners home on a triple off the wall in left-center. Another pair of walks, this time by RF Christian Lopes and CF Scott Heineman , loaded the bases for LF Willie Calhoun . Calhoun was hit by a 3-1 pitch from Chatwood to plate the third run of the frame before C Juan Centeno capped the rally with a two-run single to left to put the E-Train in front 5-1. The Express would add to their lead in the fourth. Sanchez climbed aboard on a leadoff single and moved all the way to third when Lopes doubled on a sharp line-drive to left before scoring to make it 6-1 on a sacrifice fly by Heineman. The Cubs would respond with a two-run burst in the bottom half of the frame, cutting the gap to 6-3. Vosler put himself in scoring position on a double, setting the table for a two-run homer off the bat of Hannemann. In the top of the fifth, Round Rock 1B Tommy Joseph answered Iowa's longball with one of his own. On the first pitch of the day for I-Cubs reliever LHP Brian Duensing , Joseph blasted his 21st round-tripper over the batter's eye in center, stretching the Express lead to 7-3. Iowa would produce a couple of runs in the bottom of the eighth off E-Train reliever RHP Tyler Wagner to narrow the deficit to 7-5. 1B Chris Coghlan recorded a leadoff single prior to an RBI double off the bat of LF Stephen Bruno , who would move up to third on a throwing error before the end of the play. In the next at-bat, DH Mike Freeman drove Bruno home on a groundout. 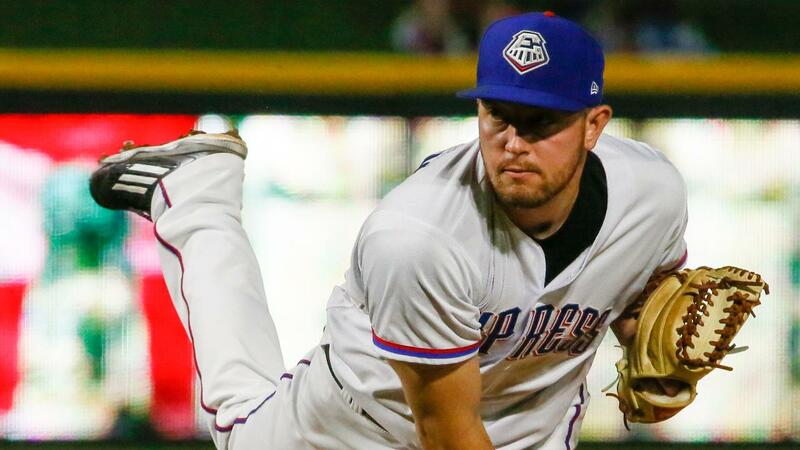 With the I-Cubs looking to complete the comeback in the, Round Rock reliever RHP Tayler Scott slammed the door shut to seal the Express win as well as his first save of 2018. Round Rock will suit up for their final contest of the season on Monday at Principal Park in Des Moines. Express RHP Austin Bibens-Dirkx (3-6, 5.68) is slated to start against RHP Alec Mills (5-12, 4.84). First pitch is scheduled for 12:08 p.m. CDT.